Today’s student matinee of Othello had a great crowd of high schoolers from several different schools. Though there was some uncomfortable twittering during some dramatic moments, for the most part they were engaged with the performance. Afterwards, the actors returned for a talk-back with the students who asked some pretty interesting questions about the characters, especially “honest” Iago. One student wondered aloud whether or not nature is indeed “erring on itself” as Othello says when he is convinced of Desdemona’s infidelity, and whether it was actually nature taking over and making everything easier for Iago to control. Ian Merrill Peakes (after recovering from his initial shock), responded that Iago is taking advantage of the side of Othello’s nature that perhaps no one sees. Nature is erring on itself and warping back into being more natural, but everything that happens comes from the characters’ true natures at some point. Another student commented that Iago is a character with many faces, and how did Ian approach that twisted character? Iago is a sociopath, Ian remarked, and believes in some way that what he’s doing is right, or for the greater good. Everyone also agreed that their characters truly believe Iago to be their friend throughout the play, until proven otherwise. Ian mentioned that Shakespeare gives you all sorts of clues, but also all sorts of nothing in terms of playing this part – each relationship Iago has is represented with a different attitude, a different face, and choosing which one to play when is the real work. All in all, we were very impressed and pleased with today’s audience, and are looking forward to our next two student matinees next month! If you could ask anything of a character from Othello, what would it be? Folger Theatre hosts student matinees for their innovative productions each season. School groups attend in droves to see fresh life breathed into Shakespeare’s texts, or a creative new concept or setting which sets the production apart from others. 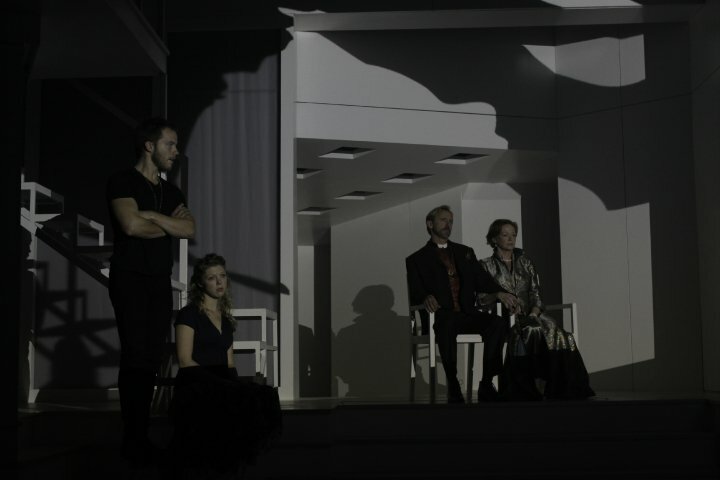 HAMLET, Folger Theatre 2010. Photo by Carol Pratt. Occasionally, however, an audience member at one of these performances will take offense to an interpretation, a character, or even a line of text from the play. The Theatre does its best to make recommendations on age-appropriateness, and we do our best in Education to present the Director’s vision with background information and discussion topics from the plays in each of our study guides for these audiences ahead of time for preparation. Yet there still may be a person who takes offense at something from the play. 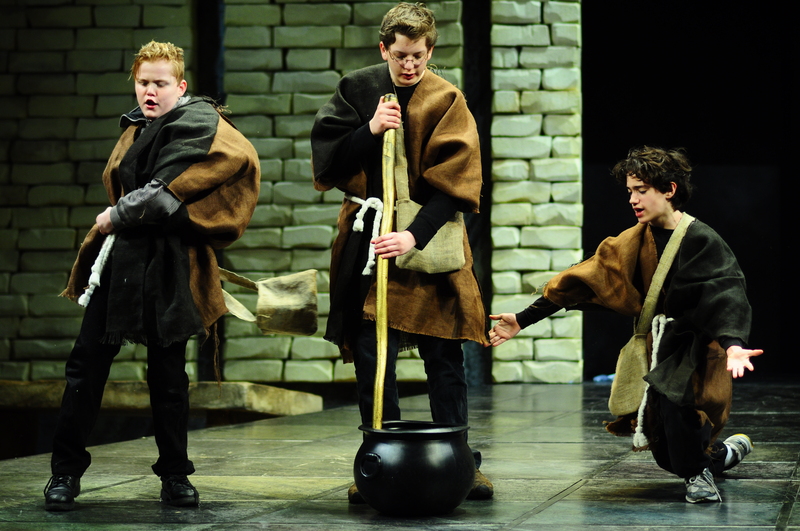 How do you prepare your students for a performance of a Shakespeare play? Do you research the Theatre’s performance history? Is Theatre etiquette discussed? Do you read the play ahead of time or is the performance an introduction? Are themes and social or moral issues from the play discussed ahead of time, or afterwards? We’re very interested in learning how educators prepare for a performance with their class, so please let us know in the comments! Carl Van Vechten. Portrait of Paul Robeson as Othello. Silver gelatin photographic print, 1944. Folger Shakespeare Library. We are about halfway through the fall semester of the High School Fellowship Program. Every year we bring students from public and private schools from DC, MD, and VA to study three Shakespeare plays from three perspectives: scholar, performer, and audience member. The students all bring unique ideas to the table and challenge themselves and each other through text based analysis of the plays. Yesterday we continued the Othello conversation. As a theatre practitioner and person of color, I have frequently walked away from Othello experiences dissatisfied. Productions I have attended did not seem to tell the whole story. Discussions of the play did not move beyond black and white. The question of “otherness” is so much more pervasive and timeless. Our fellows engaged in a mature conversation about faith, jealousy, loyalty, and race as they relate to Othello. It is not often that I sit amongst a fairly diverse group of young people who are able to step outside of what they know/experience as being different. Below are some questions we discussed. They did not agree on the answers, however, their responses made this tragedy accessible and exciting. Despite his position is Othello weak? What are all of the ways in which religion permeates the tragedy of Othello? What is at the core of Iago’s motivation? What does Desdemona leave behind when she travels to Cyprus? How can Emilia betray Desdemona? Shakespeare is one of the most recognized figures in literature, and his works have been adapted and adapted and adapted over and over and over again for the last 400 years by people interested in exploring the stories and characters in new ways. And that is exactly what Shakespeare did, as well. However, Shakespeare didn’t title his work as Romeo and Juliet, inspired by Ovid, or Richard III with liberties from Holinshed’s Chronicles. His work was completely his own invention as far as the language and the way the story fell anew. He’s even been called on his artistic license! Well, at least on Horrible Histories. What’s still so interesting to me about how we adapt Shakespeare’s works for modern readers, filmgoers, and audiences is we often do use the original author’s name as a selling point, or blatantly use his (or his play’s) name in the title for recognition. This isn’t all the time, but it’s plenty enough. If Shakespeare felt comfortable claiming his own work as his own, why aren’t we as secure in letting him go from our adaptations of him?